Last month we had our annual Bible camp in the mountains with a bunch of other families from our church. As usual, I was in charge of getting the food planned and bought, then handed off much of the actual cooking to others once we got to camp. Though much of the menu is the same from year to year, each year I try a thing or two that’s new. This year it was dessert. Usually we use the camp’s soft-serve ice cream machine, but it was broken, and it’s kind of a hassle to take ice cream for 80 on a three hour car ride in the summertime. I also had a handful of gluten free people to feed. So what could I make that was creamy and yummy and ice-cream-like, and also gluten free? I decided to adapt an old favorite recipe, ‘Dirt’ Dessert, into something easier to pull together for a crowd. The bottom layer is chocolate pudding mixed with raspberries or blueberries. The white layer consists of cream cheese, powdered sugar, and cool whip. You can sprinkle crushed Oreos on top if you like, or skip the Oreos to make the dessert completely gluten free. Frozen, it was a cool and delicious dessert that seemed to please a lot of folks. Bottom layer: In a very large bowl combine pudding mix and milk. Mix well with a wire whisk. Let sit ten minutes in refrigerator, then gently stir in frozen berries. Divide the mixture between two 12x16 pans, spreading it as evenly as possible. Top layer: Whip together powdered sugar and cream cheese in a large mixing bowl. (A hand mixer would probably work best.) When well mixed, fold in Cool Whip. Use a large spoon to drop mixture as evenly as possible across the pudding mixture. To serve: Cover pans with wax paper or plastic wrap and freeze until serving, at least two hours. Half an hour before it's time to serve, roughly chop oreos and sprinkle lightly across the top of the pans. If you are serving folks who are gluten free, leave part of one pan plain, without Oreos. Cut into squares and serve. Tip: If you are making this for folks who are gluten free, be sure to select pudding mix that use cornstarch, not wheat products as thickening. Molly’s Chicken— we did this one this year instead of our traditional ham dinner, for half the cost that ham usually is. Lots of people came back for seconds, and even little children seemed to enjoy it. We served about 140 chicken legs to 80 or so people, and only had bout 20 left over. I used nicely-trimmed chicken legs that you can buy at Costco in multipacks for about $1.29/lb. BBQ Meatballs— We served these in hot dog bugs or over rice, and people seemed to enjoy them. For 70 people, we used 15 pounds of pre-made frozen meatballs from Cash and Carry, and also made about 5 pounds more of meatballs that were gluten free. I also found a gluten free BBQ sauce to serve over them, but ended up deciding that the BBQ sauce recipe in Family Feasts for $75 a Week is more to my taste. Ah well. Chili for a Crowd–This is the second year I’ve made this recipe. People like that it is very hearty and full of meat. We made a turkey roaster full of mild chili and a crock pot full of spicy chili, and had only a little left over when serving about 75 people. I loved seeing the tried and true recipes you use for a crowd. Always looking for new ways to change up feeding a house full. Thank you for sharing. Your dessert looks great but I like desserts to be super simple. 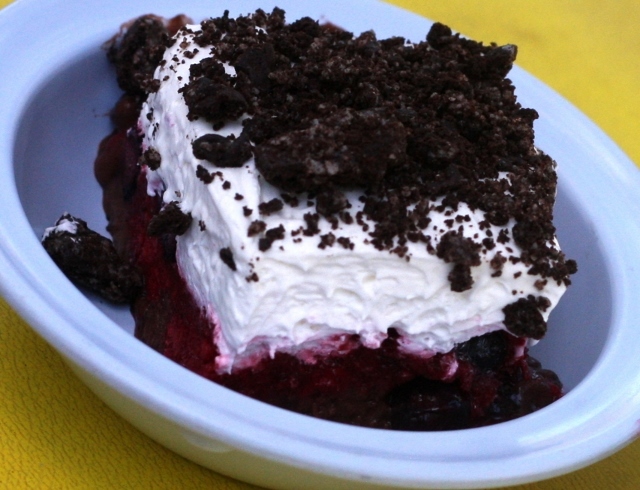 One of our favorite desserts is equal parts french vanilla pudding and sour cream mixed together and then alternate this mixture with berries topped with whipped cream. Fantastic and easy. One of my favorite meals for a large crowd of people is an oriental take on spaghetti—sesame noodles—spaghetti noodles made with green onions, carrots, and peppers served with hard boiled eggs, and sliced fruits. As a family that does not eat red meat, have to be a bit creative in meal planning using chicken, fish, tofu, seafood, and turkey more than the average family.